Provides web design and development, internet applications, streaming media, Java, JSP, Perl, and database integration. Based in Bethesda, Maryland, United States. A dynamic, easy-to-implement Content Management System designed for efficient management of web content in information-intensive enterprises. Content management consultants specializing in planning, strategizing, designing and implementing content management solutions. Home to the author of 'The Content Management Bible' (Hungry Minds Publishing), Bob Boiko. Content management consultancy specializing in XML consulting and training, content management and system integration solutions. Also provides web content management services, multi-channel publishing assistance, and data conversion. SELBSTDENKER Frameworks 5.1 combines easy handling and efficient use and presents a flexible interface for complex Content Management Solutions/ Enterprise Content Management between information supplier and user. A repository for information about enterprise content management (white papers, articles, book reviews, research). Maintained by Scott Abel, content management strategist. Content management solutions including document content management, web content management, web application development, XML consulting, & SGML development. The pTools Enterprise Suite is an industry leading enterprise content management platform. These components when deployed allow enterprise-wide control of all content, from publishing to workflow to knowledge management. Insite Server is an Out-of-the-box, 100% Browser-based, Open Standards-centric XML Content and Document Management Software. How to build a complete, expandable, client-side content management system using REBOL. Provides content management software and complete systems to unify content, document, and knowledge management for enterprise networks. Designs and develops content management solutions and Web sites exclusively for industrial companies using content management software, tmsPublisher. MetaCanvas is a visual web content management system that allows anyone to manage the content and growth of their website without needing technical knowledge. A multilingual web-based content management system, featuring content authoring, workflow management, and versioning. Supports publication to multiple locations. Web-based content management platform for easy web content management and publishing. SiberSafe XML is an XML content management system that focuses on collaboration, version control, reuse, language translation, single-source publishing and workflow control for XML content development. Incommand Interactives solutions simplify and streamline the process of updating Web site information by offering easy to use, browser-based Web authoring and content management. European resource for content managers and suppliers including topics such as personalisation, syndication, dynamic / static content, XML, templates, and workflow. Provides systems integration services and custom content management solutions dealing with XML integration, digital asset management, web content management, and cross media publishing. A provider of content management and multi-channel content distribution software solutions. Provides the technical foundation for content billing through its tracking, tracing and usage reporting capabilities. A browser-based XML content management .Net component for managing XML and HTML content. Features include form handling, wysiwyg editor and support for multilingual content. Web content and user management system. WYSIWYG (MS WORD style) content editing, role-based workflow, rollback versioning, multi-lingual versioning, content scheduling and multi platform content delivery. E-GIF, WAI and BOBBY compliant. Content management system which allows changes to the content of an Internet presentation. REDtechnology offer content management and hosting services to companies in the UK, including the ConductIT content management product suitable for business of all sizes. Online exhibition for the content management industry. Featuring the leading companies, plus the latest, news and whitepapers. Free to register. Content management software custom-tailored for complete control of your site, and design services. 100% Java Content Management. The Polopoly system is developed for rapid publishing, management and distribution of content in any number of digital channels. If the business hours of BrowserMedia in may vary on holidays like Valentine’s Day, Washington’s Birthday, St. Patrick’s Day, Easter, Easter eve and Mother’s day. We display standard opening hours and price ranges in our profile site. We recommend to check out browsermedia.com/ for further information. 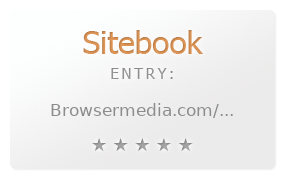 You can also search for Alternatives for browsermedia.com/ on our Review Site Sitebook.org All trademarks are the property of their respective owners. If we should delete this entry, please send us a short E-Mail.